Wright Morris (right) signing his books in the Heritage Room. A new Heritage Room display on the second floor of Bennett Martin Public Library in downtown Lincoln celebrates author Wright Morris. Morris gained critical acclaim as a novelist and as a photographer. He received a National Book Award twice, in 1957 for The Field of Vision , looking at how a visit to a Mexican bullfight alters the lives of a group of Nebraska tourists, and in 1981 for Plains Song. Photography and fiction were equally important in Morris' extraordinary life-long effort to capture the soul of the Midwest. In 1942 and again in 1946 Morris won a Guggenheim fellowship to support his photographic projects. The support enabled him to return to Nebraska and to produce his first two photo-texts, The Inhabitants, and The Home Place. These ground-breaking works, combining photography and fiction, have been recognized as an attempt to create an entirely new literary form. In honor of the 100th Anniversary of Wright Morris's birth, the Nebraska Center for the Book has chosen The Home Place as the One Book, One Nebraska book for 2010. The Lone Tree Literary Society in Morris's birthplace, Central City Nebraska, will host many of this year's One Book One Nebraska activities. Nebraska's 2010 Letter's About Literature Winners at the Heritage Room. 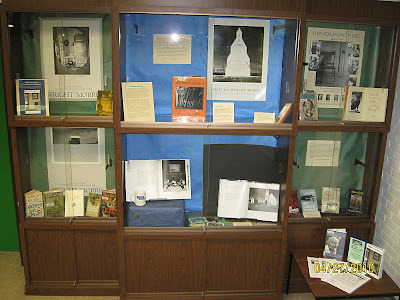 "Letters About Literature" is a national reading promotion for children and young adults sponsored by the Center for the Book in the Library of Congress and locally coordinated through the Nebraska Center for the Book. Contest participants compete on three levels: Level I for young readers in grades 4-6; Level II for young adult readers in grades 7-8; and Level III for readers in grades 9-12. Young readers are asked to write a letter to an author, living or dead, explaining how that author's work somehow "gave them wings" (Level I), became a part of their life (Level II), or changed their view of the world or themselves (Level III). On April 7, this year's Nebraska winners gathered in Lincoln. They toured the State Capitol, met with Governor Heineman, were treated to a dinner, and closed their special day at the Heritage Room (where the winner from Alliance was present via video conference) and signed their submissions. Winning letters will be accessible online courtesy of the Nebraska Library Commission. 2010 Willa Cather Annual Spring Conference, June 3-5. The theme of the 2010 Willa Cather Annual Spring Conference in Red Cloud Nebraska will be "Food, Drink, and Willa Cather's Writing." Register online by May 27th at www.WillaCather.org. The keynote speaker will be Susan Meyer of Wellesley College. Cather's O Pioneers! and "The Bohemian Girl" will be specially featured at this year's conference. Conference dates are June 3-5, 2010. Hilda Raz is a native of Rochester, New York. She has lived in Nebraska since 1963. She has been editor of Prairie Schooner since 1987. In 1993 she was named the first Luschei Professor and Editor in the Department of English at the University of Nebraska-Lincoln. She teaches English and womens' and gender studies. She has published poems, essays, articles and reviews. Her recent books include: What Happens (2009), All Odd and Splendid (2008), and, with Aaron Raz Link, What Becomes You. The program begins as 2:00 P.M. Sunday April 18th, in the Heritage Room on the third floor of Bennett Martin Public Library in downtown Lincoln. All Ames Readings are taped for later broadcast on 5 City TV, Time Warner Cable Channel 5. Please join us. The Loren Eiseley Society presented a great book launch program at the Great Plains Art Museum in Lincoln this past Saturday. Eiseley Society president Bing Chen chaired the event. In the snapshot above we see him thanking the folks at Infusionmedia Publishing for their contribution to the project. 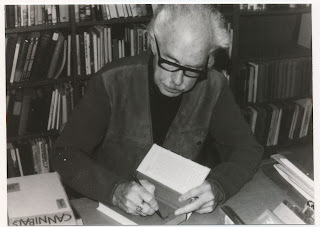 Ray Bradbury wrote the foreword for the reader and, since he would be unable to travel, Dr. Chen visited him in California and interviewed him on video to introduce the book launch proceedings. Bradbury's remarks about his long friendship with Eiseley were most striking and very memorable. We hope the Eiseley Society will make them more widely available in the future. The main event was a theatrical reading of Jim Cook's script "Memory's Night Country," adapted from the Loren Eiseley Reader. The distinguished guest readers are seen facing the audience in the snapshot. To Bing Chen's left (moving nearer to the observer) we see Michael Forsberg, Jim McKee, and Matt Harvey (out of the picture are Lisa Knopp and Kam Veney). To Bing Chen's right (moving away) are Jennifer House, Patrice Berger, Polly Wimberly, Lora Black, W. Don Nelson, and Marge Saiser. Also in the picture are Jim and Gwen Cook (at the left, Jim is facing away from the camera), and (at the far right) Ruth Thone, founding president of The Friends of Loren Eiseley, the predecessor of The Loren Eiseley Society. Beng Chen brought the formal proceedings to an end with a heartfelt invocation of Eiseley's importance in allowing us to see our relationship with nature anew, and change it for the better. The reader is designed to encourage teachers to introduce Eiseley to a new generation of readers.